Another week, another unforeseen and unique offering from Trader Joe’s. Trader Joe’s Olive Oil and Lemon Juice is not only a unusual sounding mixture, but it’s basically unprecedented anywhere, as far as I can tell. So unusual, in fact, that I’m still not certain that I haven’t just dreamed it. What it is: Olive oil mixed with lemon juice. Worth it: It’s not bad, just really pointless. Drawn in by the unique name, I found that this was a classic case “what you see is what you get”. 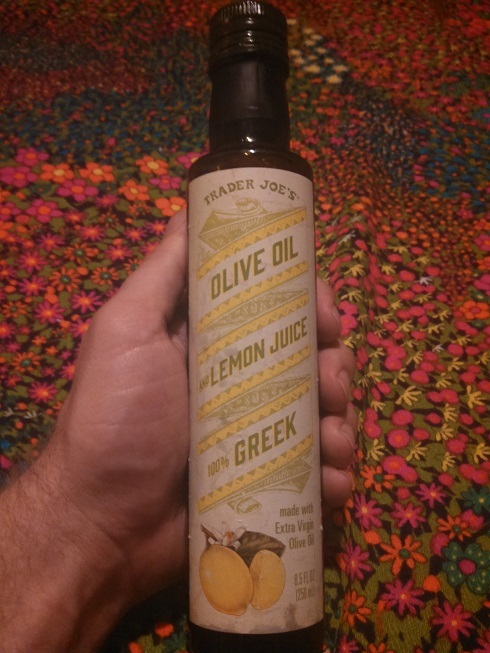 Trader Joe’s Olive Oil and Lemon Juice is exactly that – a mixture of their somewhat acclaimed 100% Greek olive oil with a dash of lemon juice mixed in. Why you would want to do such a thing is the puzzle. Trader Joe’s has quite a wide selection of extra virgin olive oils, and generally place quite highly in the metric of quality vs. price. However, as Trader Joe’s themselves point out, extra virgin olive oils are supposed to have less than 0.8% acidity. It would seem to me that adding a bunch of lemon juice would sort of wreck your pretensions to high quality EVOO. Of course, people do have a long tradition of adding another common acid to olive oil – balsamic vinegar. Of course, this is usually done at the table – no one, to my my knowledge, is currently offering a blend of extra virgin olive oil and vinegar in the same bottle (although TJ’s has probably thought about it). As far as I can tell, this bottle of lemon juice and olive oil seems to be intended to fill the same roll as the more common balsamic vinegar and olive oil mixture. The bottle itself even mentions using it as “a salad dressing or sauce sauce for seafood, fish and vegetables. If so, it’s a pretty poor substitute. Lemon juice lacks the body and complexity of a really good (or even a really average) balsamic vinegar. There is a little bit of a zesty zing to this olive oil, but it’s very subdued and one note – nothing like the satisfying blast of flavor you get with a good, viscous vinegar. Confusing matters more, there isn’t very much lemon juice in this olive oil and lemon juice mixture. Poor out a good drizzle of olive oil on your salad or veggies and what you’ll taste is: olive oil, olive oil, olive oil, a tiny hint of lemon, and olive oil. Even if I was into the idea of replacing balsamic vinegar with lemon juice, this doesn’t seem like the way to do it. I’ve got a little squeeze bottle of lemon juice in my fridge right now – why wouldn’t I just zazz up my regular, all purpose olive oil with a couple squirts of that? Despite the very lovely bottle, Trader Joe’s Olive Oila nd Lemon Juice left me deeply confused. Who is this for? Why would I want to buy a perfectly good Greek olive oil that’s been pre-mixed with just enough lemon juice to ruin its extra virgin nature, but not enough lemon juice to actually taste like anything? Is it just a convuluted plan by TJ’s to sell off impure extra virgin olive oil by masking it with lemon juice? Surely it’s not meant to be a pre-mixed detox solution for people going on olive oil and lemon juice colon cleanses, right? In any case, I can’t think of anything this can do that you can’t already do better with the regular olive oil and lemon juice you already have. Would I Recommend It: Nope – you don’t need this. Would I Buy It Again: Nope, I don’t need it either. Final Synopsis: Perfectly good olive oil, but with a tiny little dash of lemon juice mixed it. It’s lemon… like you’ve never seen him before! 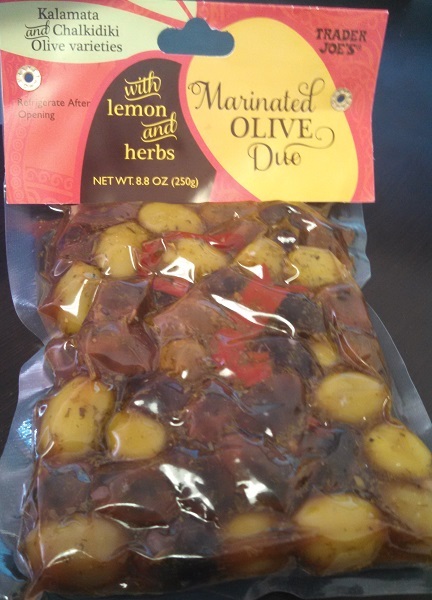 Trader Joe’s preserved lemons are unlike any other sort of lemon you may have tried before. People do lots of weird things to produce that they store in jars. Sometimes they’re pickling it, sometimes they’re making it sweet, sometimes they’re just packing it in tons and tons of oil. Whatever it is, it’s always impossible to tell what you’re going to get until you actually pop the jar open and give it a try. In this case, I was surprised to find that what they were doing was making the lemons less sour. 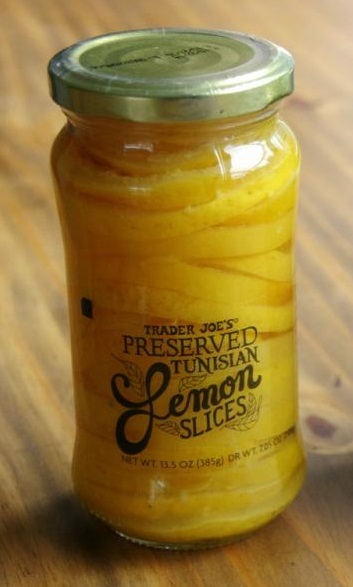 The lemons in TJ’s Preserved Tunisian Lemon Slices contain all the flavor of that famous yellow citrus fruit, but none of the acidity or sourness. The result is a slightly unnerving but intriguing food experience. I was really, really not expecting this. Frankly I didn’t even know it was possible to unsour lemons. Really, I didn’t know what expect when I picked these up – and Trader Joe’s was not in a helpful mood when they created the packaging. Search the jar and you’ll find no description of what to use these lemons for, or how they might taste. The one clue that TJ’s sort of lets on to is when they casually mention “Be sure to rinse under water – unless you really like salt.” That might lead you to believe these lemons will be salty. And while yes, indeed, the brine they’re packed in is very salty, that salinity doesn’t make its way into the taste of the lemons. The only reason the lemon slices are soaking in a salt bath is because salt draws out and neutralizes the bitterness of the lemon peel and acidity of the lemon juice. The result is lemon slices that taste and look like lemons, but don’t make you pucker or wince. If you’ve never had them, it may hard to imagine what non-sour lemons taste like. Basically, they taste like lemon-sceneted dish soap smells. While that is a strange little thing to deal with, mentally, it’s not the only slightly off-putting part of these preserved lemons. As a necessary part of the preserving process, these lemons are saturated, soaked and soggy. Washing them off and patting them dry is about all the strain they can take without falling apart on you. You’ll have no trouble slicing through the rind of these lemons with the edge of a plastic spoon. So what are you to do with a jar of un-lemonafied lemon slices? The answer is, pretty much anything. The best way to think of these preserved lemons is as a solid slices of lemon juice. Adding a slice, either diced or whole, gives a refreshing zest to any dish. The real boon here is that you can’t over load on these. With the face puckering sourness of the lemon nullified all you’re really adding is a burst of citrus flavor. The classic way to use preserved lemon is in a Moroccan tagine soup, but they really dress up any dish that would benefit from a touch of lemon zest. Dice it up and mix it in a salad, add a slice to a sandwich, or serve as a garnish for roasted chicken. If the somewhat unnatural texture and taste of the lemons doesn’t bother you, they’re an easy and interesting way to dress up almost any dish. Would I Recommend Them: Yes – these have all the perks of lemons without any of the downside. Would I Buy Them Again: One jar should last me a long time, but I’d consider it. Final Synopsis: All of the flavor of a lemon without the acid. Fooled again by Trader Joe’s brazenly ambiguous syntax! Although we haven’t spent much time looking at them yet, Trader Joe’s fields a pretty tasty line of ready to rock pasta dishes. Of course, the reason I haven’t really bothered to review them yet is that nothing has lept out at me as particularly crazy. The goal of this blog isn’t to review every average, Joe-schmo thing at Trader Joe’s, but to taste test the truly weird and daring – for better or worse. 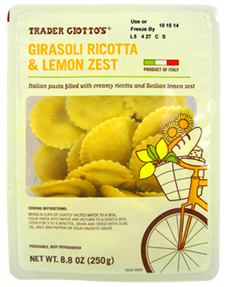 That means I haven’t felt a need to pick up any TJ pasta until now – with Trader Joe’s Girasoli Ricotta & Lemon Zest ravioli. There are a lot of delicious things to pack into ravioli, but never before this day did I dream that lemon would be one of them. Let’s start with the name, which I was somewhat disappointed by. Girasoli, as all you literate latinate lovers out there already know, is Italian for sunflower. This immediatley led me to assume that these raviolis contained both lemon and, like, sunflower petals or something. A foolhardy assumption at most grocery stores, maybe, but this is Trader Joe’s were talking about – they already tried taking the sticks out of popsickles, I wouldn’t put anything past them. Disappointingly, to me at least, there isn’t a seed or stem to be found in these ravioli. The eponymous sunflower refers, predictably, to the shape of the pasta, little flowery suns, not the contents. The lemon, on the other hand, is very real and, what’s even better, tastes terrific. Why put lemon in your pasta? Well, dammit, like most things in life the real question is why not? Actually, lemon zested pasta may be uncommon on American shores, but has a long tradition in Italy. Trader Giotto lives up to his name here by not just zesting the ravioli with lemon, but with lemons harvested from around Mount Etna in Sicily. And while this sounds terribly authentic, it’s worth noting that while ricotta and lemon stuffed ravioli are certainly Italian, they’re a traditionally Sardinian dish, not Sicillian. I really hope someone got fired for that blundered. Regardless of the providence of the dish, it’s tremendously tasty. 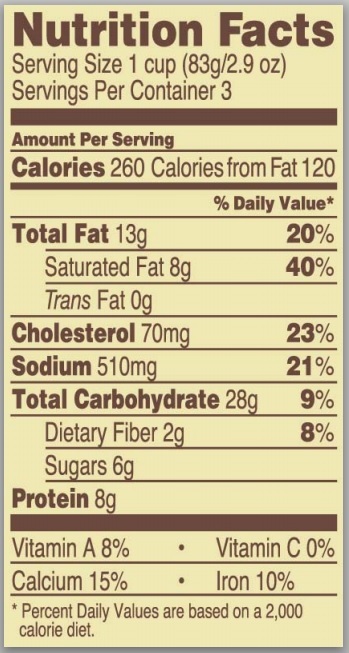 Where Trader Joe’s gets it entirely right is in keeping it simple. The pasta is a basic, wholesome combination of flour, semolina and egg. Into these tender little pockets they add mild, creamy ricotta cheese dressed up with just the right touch of lemon zest. It’s easy to imagine this step going wrong. Lemon is delicous, but add a little too much and suddenly you’re serving up acidic pasta. 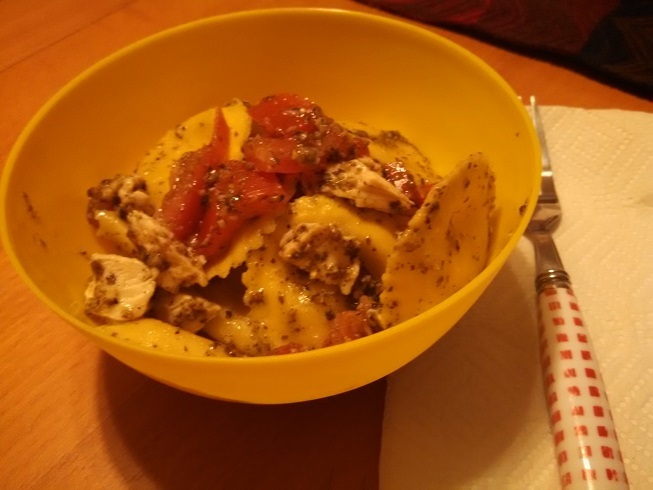 TJ’s encounter’s no such difficulties here – the ravioli are touched by just enough lemon to bring out the flavorful citrus taste without being at all harsh or astringent. In fact, more than anything, the lemon tastes mellow and creamy – no doubt thanks to the mixture of butter and bread crumbs that also make up the filling. So what’s the best way to eat this light, summery pasta? Keep it equally simple and light, of course. No need for a heavy pasta sauce here – just let the natural, intriguing flavor of the pasta shine shine through on its own – with a little help from a touch of pesto and fresh tomatoes. It’s a simple, quick recipe, perfect for a relaxed lunch or casual dinner. Boil water in a medium-sized sauce pan, and add the ravioli. Keep on boil for 6-7 minutes, until appropriately al dente. Drain and place in a mixing bowl. Add sliced tomato, a nice bit of pesto and mix. Would I Recommend It: Yes, these ravioli are refreshing and filling. Would I Buy Them Again: Certainly. Final Synopsis: A traditional Sardinian ravioli that keeps things fresh with the right amount of lemon.